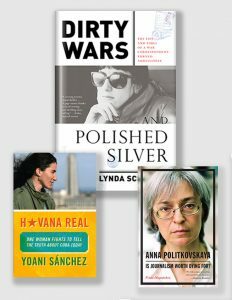 Dirty Wars and Polished Silver: The story of former Wall Street Journal bureau chief Lynda Schuster’s life abroad as a foreign correspondent in war-torn countries, and, later, as the wife of a U.S. Ambassador, chronicling her time working on a kibbutz in Israel, reporting on uprisings in Central America and a financial crisis in Mexico, dodging rocket fire in Lebanon, and grieving the loss of her first husband, a fellow reporter, who was killed only ten months after their wedding. Equal parts gripping and charming, the document of one woman’s quest for self-discovery — only to find herself, unexpectedly, more or less back where she started: wiser, saner, more resolved. And with all her limbs intact. Havana Real: Yoani Sánchez is an unusual journalist: she produces a simple diary about what it means to live in contemporary Cuba, complete with chronic hunger and difficulties shopping; the need to constantly repair ancient appliances; enduring a propaganda machine that pushes deep into public and private life. For her simple acts of truth-telling, her life is one of constant threat. But she continues on, refusing to be silenced — a living response to all who have ceased to believe in a future for Cuba. Is Journalism Worth Dying For? : Anna Politkovskaya won international fame and worldwide respect for her courageous reporting. Is Journalism Worth Dying For? is a long-awaited collection of her final writings, showcasing her self-effacing wit, offering deeply personal statements about the nature of journalism, relaying horrendous details from the Russian war in Chechnya, and, finally, including the first translation of the series of investigative reports that Politkovskaya was working on at the time of her murder on Vladimir Putin’s birthday in 2006 — pieces many believe led to her assassination.